I’ve recently had the chance to try out the new f-Stop Satori pack and was pleased to find the same high quality that they’ve been putting into all their packs. This is the largest of the family, weighing in at a little over 4 pounds (1850 Grams) with no ICU (Internal Camera Unit) and a volume of 3,500 Cubic Inches (58 Liter). It has the same bomb-proof zippers these packs are famous for, and it is made of Double-Rip Stop, Abrasion Resistant Nylon Web, and Waterproof Urethane-coated mesh. More stats can be found at the f-Stop gear site, so now I’ll talk more about function. What I love about these packs is the comfort and suspension system in hauling heavier loads. My background is from lightweight long-distance backpacking, so I’m usually carrying a much lighter pack. But this bag’s metal internal frame is so supportive that it makes me feel like I’m carrying a much lighter load. At first glance it didn’t look much larger than the earlier Loka design and it left me scratching my head, but given the packing volume it is about 50% greater than the Loka. I’ll soon be using this on my first foray into the backcountry for a two-night test soon. With their smallest ICU, I’ll be able to fit my tent, sleeping bag, food bag, small cook stove (homemade out of pop cans), and a few extra clothes into the pack. I’ll strap my tripod to the side and give a go—and I’m looking forward to it. The Satori has plenty of other pockets to carry a laptop if needed, extra cards, batteries, filters, and other backcountry camera needs. Other pockets can be used for my water filter, bottles, small items such as a hat or gloves, and at the bottom there is a pocket for my rainfly. My camera and camping gear can all be accessed from the zippered door between the shoulder straps, or I can top load it like a regular backpack. The door however, will offer quick access to my camera equipment at the bottom of the pack and under all my gear. The access door is against my back, so when I drop the pack for access, it isn’t picking up all the mud and dirt from the ground and then dirtying my back—that is left to the rainfly to handle. 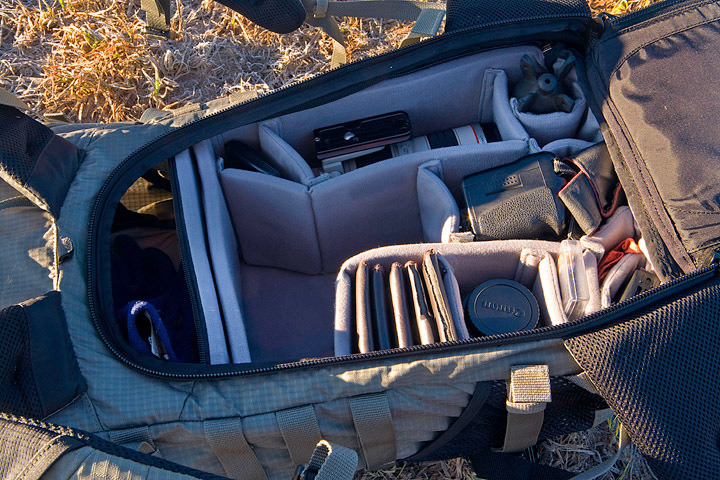 Below is the Satori pack loaded with camera gear with the access door open to the larger ICU. 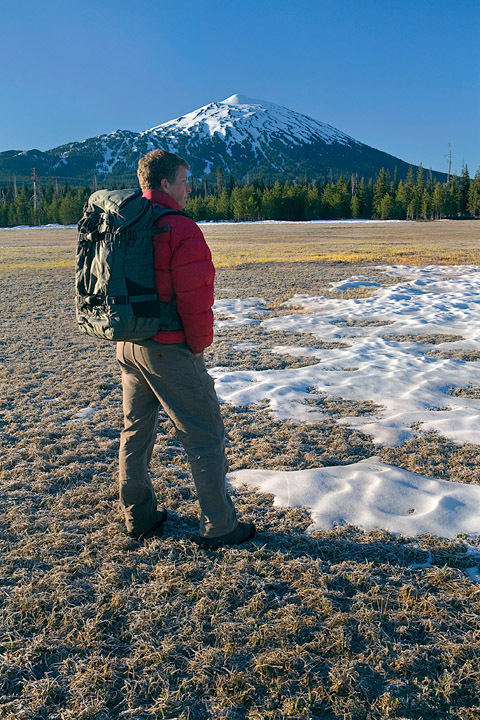 Below is an image of Sean Bagshaw (Photo Cascadia team member) modeling the Satori pack in the Three Sister’s area of central Oregon, with Mount Bachelor in the background. I’ll be writing an update to this review once I’ve taken the Satori for a spin in the backcountry, so stay tuned. ~ by photocascadia on July 11, 2011. Thanks for the review. I’m a bit confused though, as this bag has been listed as ‘discontinued’ for some time on fstopgear.com. Are they working on an new version that will be available soon? Thanks! I’ve been tempted at times by these packs, but I’ve never gone for them because of the relatively small internal volume. I use a Gregory Whitney, which is 95 Liters, and even then I have found it sometimes a challenge to pack all my camera and camping gear. I just recently spent a week hiking below the rim in the Grand Canyon… 60 lbs of weight to begin the trip and the pack was enormous. I can’t imagine doing something like that with less volume.